BOB ABERNETHY, host: Now an update on New Age spiritual seeking; that’s seeking with the help of such things as crystals, psychic readings, channeling and astrology. If you thought New Age spirituality had disappeared or gone underground, take a look at what Lucky Severson found when he joined the millions of seekers drawn each year to Sedona, Arizona. 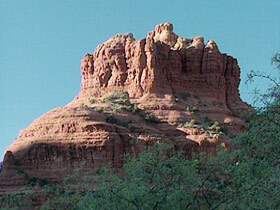 LUCKY SEVERSON: Legend has it that long before civilization, Native Americans felt such reverence for the red majesty of Sedona, they refused to live here. But that did not stop the white man. ANGINAINE MORE (Concierge, Center for the New Age): But it is still a pretty sacred land. Lots of energy here. SEVERSON: This is Anginaine More, the concierge at The Center for the New Age. Ms. MORE: I direct people in helping them find psychic readers, massage therapists, things of that nature. SEVERSON: A lot of things of that nature here in Sedona. Psychic physicians, tarot card readers, channelers, astrologers. For those in need of a psychic makeover, this is the right place. Ms. MORE: I was just passing through and I’ve been here ever since. SEVERSON: More people come to Sedona each year than to the Grand Canyon, about 80 miles away — six million by the latest count — many of them New Agers or spiritual seekers looking for answers. Mrs. ANGEL BRUSKI: What about contacting spirits that have died? Ms. MORE: Oh definitely, they can do that. SEVERSON: Doctor Adam Bruski and his wife Angel from Pittsburgh. Dr. ADAM BRUSKI: This is more for my wife than for me. Mrs. BRUSKI: I think we are on the verge of a spiritual revolution and I think it is important to look beyond materialism and success and things like that and ask why we are really here. SEVERSON: Angel wants a reading of her past life regressions. Adam sits in. UNIDENTIFIED WOMAN: The first thing we do, is we say a prayer and then after that, we start the clock. NOAH CARSON (Channeler and Spiritual Healer, Center for the New Age): I work with the ascended masters. I work with the angelic realm. I can actually hear the voices. SEVERSON: This is Noah Carson, a channeler and spiritual healer who says he can commune with Christian, Hindu, and Buddhist deities and heal sick people. CARSON: I am channeling, and when I close my eyes I basically align my will with the higher will. 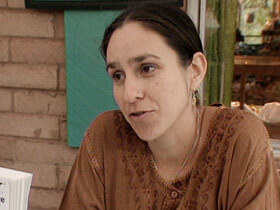 SEVERSON: Sedona attracts seekers from all over the world. This tarot card reader is from Germany. TAROT CARD READER: One for the spirit’s advice, God’s advice, whatever you want to call it. SEVERSON: Her client, recently retired, is a little worried about her future. TAROT CARD READER: In the next 4 to 6 months, there will be a huge transformation. JAMIE BUTLER (Co-Owner, Center of the New Age): People come here seeking something. They are seeking their spirituality. A lot of times they have lost their way. A lot of times they are desperate for healing in their lives. They feel empty, unfulfilled. They are old world and corporate is not working. SEVERSON: Jamie Butler is a co-owner of the Center for the New Age. She says she can read your energy field with aura-imaging photography. And that they tell her who you are or who you should be. Ms. BUTLER: We pick up spirit gods in the auric photo. Look here, we have angel wings. This isn’t surprising because this is actually a psychic of ours who channels the archangel Michael. Crystals are conscious beings. They are powerful healing tools. They have been used in radio transmitters, they are conduits of energy. SEVERSON: And they are for sale. New Age products generate one billion dollars annually. Ms. BUTLER: This particular crystal. Oh it is on sale for $890. Though we do have crystal balls that go up to $2000 or $3000, some of them. 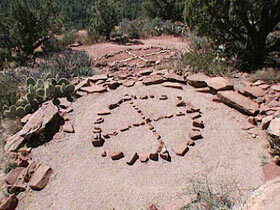 SEVERSON: We joined some newlyweds, Andy and Amy Garcia on a jeep tour of some of Sedona’s sacred sites and vortices. They are like 64 percent of visitors here, according to a Chamber of Commerce survey, looking for a spiritual experience. AMY GARCIA: Speaking for us and our friends, at least, we are more into the spiritual aspect of religion. Or more spiritual aspect of life. Like in our daily life, for instance, our workouts aren’t just running. They are yoga, they are meditation, they are massage. SEVERSON: Our guide, Marty, tells us we are embarking on an organic journey and speaks in a language we don’t always understand. MARTY (Center for the New Age): There are places on the earth than can inspire and can really bring people back to a certain wholeness. SEVERSON: And after we make our way past other jeep tours, and wait for the silence of a sky free of sightseeing helicopters, Marty translates a Native American poem. SEVERSON: Native American religion is an important part of New Ageism. So are Buddhism, Hinduism, and Christianity. Ms. BUTLER: We all believe in a higher power. Whatever that is. Buddha, God, it doesn’t matter. What the New Age is about is that it is saying hello, let’s love ourselves. Let’s release the guilt and shame. Let’s take care of ourselves. New Age is about fun too. This is actually a vortex in a can. Bit of humor for the relatives to take home. SEVERSON: If not for the vortexes, or vortices, Sedona would be just another magnificent home for golfers, artists, and rich retirees — what it was once. The awesome landscape of Sedona was a well-kept secret until the 1980s, when a traveling psychic said she was visited by a 3000-year-old druid. She said the druid told her that there are powerful vortexes here in the red rock, like the one I’m standing on — where the earth’s spiritual energies are concentrated and magnified. Dr. DONNA DARCY: I think that any type of religious person would feel that there is a God here. You have to feel it coming in. SEVERSON: Only about 40 percent of Sedona’s visitors are New Agers. Not everyone is convinced. (to Frank Campbell): Can you feel the vibrations? Can you feel anything? FRANK CAMPBELL: To be completely honest, no. SANDY ROBBINS: I think it takes people away from the real truth, which is Jesus Christ. I think it stands in opposition to everything God stands for. SEVERSON: There are several established religions in this town of 16,000, and apparently, religious harmony. Earlier this year, religious leaders met and agreed not to speak negatively of new age disciples or their beliefs. Father J.C. Ortiz says there is no doubt that the presence of God can be felt here, but that it’s a Catholic god, a Protestant god, a Jewish god. Father ORTIZ: I don’t think I would find fulfillment for your term New Ageism. For me, I think the fulfillment comes in living out the Gospel of Jesus Christ. Trying to be an example of what he taught us to be. SEVERSON: Bill Leonard is dean of the Divinity School at Wake Forest University, and he is concerned about the growing popularity of New Ageism. 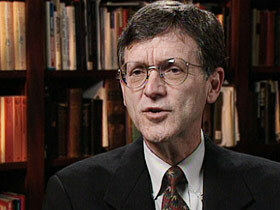 Dr. BILL LEONARD (Divinity School, Wake Forest University): One of the things that those of us who study religion and history might ask is whether or not some of these new age practices might represent what I call quick-fix religion. That is, you buy a crystal, you buy an amulet, involve yourself in incantations and chants as a way of hurriedly moving toward some kind of quick religious experience. SEVERSON: One of the more common criticisms of New Age is that it is all about the individual. Ms. BUTLER: The New Age is where we get in touch with our own self growth and take responsibility for our physical and spiritual and emotional health. Dr. LEONARD: You have to ask, “are these religious practices narcissistic”? Are they so highly individualistic that they promote a kind of me-ism. Ms. BUTLER: The culture of narcissism has gotten a bad rap. And it is about time that we started paying to ourselves. If we are not working on ourselves as human beings, if we are not taking care of our own needs, we become victimized. Or we become the people that our children can’t look up to because we have never worked on ourselves. SEVERSON: Remember, almost two out of three people who come here are searching — for something. Dr. LEONARD: You have people whose traditional religions just don’t speak to them. And traditional religions can get set in their ways, and expect that simply because they claim to have truth, everybody should run to them. Mrs. GARCIA: For the most part, I think it is hard to go. The message isn’t clear. It is gibberish and it doesn’t apply to your daily life. GARCIA: Maybe it’s that our religions in and of themselves as they are today are not getting us fully to where we need to be. The Generation Xers are just using other methods and added methods of getting there. SEVERSON: But it is not only Gen Xers, it’s also their parents who are standing on the 300-million-year old vortexes of Sedona. The City Council predicts the number of visitors will double in six years. 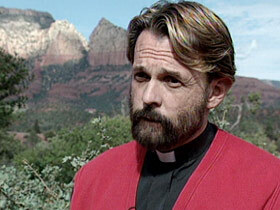 For RELIGION & ETHICS NEWSWEEKLY, I’m Lucky Severson in Sedona. 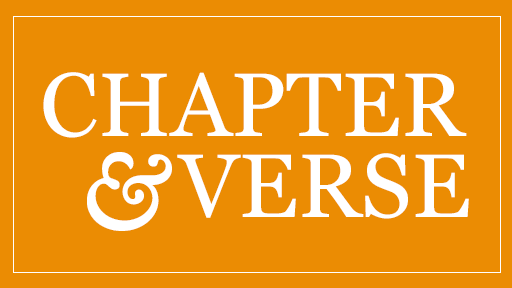 A regional site with links to follow for new age retreats, tours, products, etc. in the sedona area. A regional site with local information and events, and new age “what to do” info. A journal edited by Phillip C. Lucas, professor at Stetson University in Florida and an authority on new religious movements in America. This site includes extensive bibliographies on alternative religious movements. by J. Gordon Melton, director of the Institute for the Study of American Religion in Santa Barbara, California, an expert on new religious movements. The magazine is published by the Center for Studies on New Religions (www.cesnur.org), an international network of scholars affiliated with the Institute for the Study of American Religion.